What should producer responsibility reform look like? 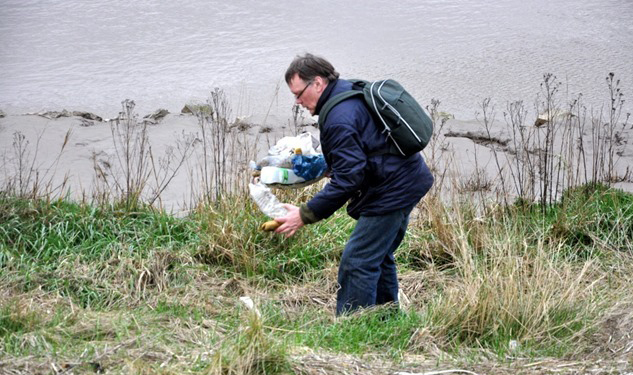 Waste is given a new life as art in a show at GroundWork Gallery in King’s Lynn, the UK’s only gallery to specialise in art and the environment with the aim of demonstrating how art and artists can enable deeper thought about environmental issues. The show, entitled TrashArt, has a waste and recycling theme, and its main exhibition comes from Dutch artist Jan Eric Visser, who has created sculptures using paper and packaging waste from his own home, as well as innovative recycled materials not often found in the fine art world: Aquadyne, a drainage product developed in Scarborough from waste plastics, and a new translucent concrete created by the Eindhoven University of Technology. Much of the aggregate and cement in the concrete has been replaced with waste glass and other recycled materials, and the product is self-cleaning, using UV light to prevent algae growth as well as to counter air pollution by removing nitrogen oxide particles from the air. Visser has called waste “the new gold” and describes his artistic process as ‘form follows garbage’, using everyday waste as a starting point to lead him towards a final piece of art. As part of British Science Week (9-18 March), Visser will also be working alongside women supported by social enterprise 4Transform to make art from waste found in the local area. Also on display at the gallery is 'The Surrey Hills', an audio-visual piece by duo Henry/Bragg about a landfill site, and a photo exhibition by Gina Glover documenting roadside plastic bottle litter, 'The Entangled Bank'. The TrashArt show will run from 10 March to 2 June, and more information can be found on GroundWork Gallery’s website. Absorbent hygiene product recycler Knowaste’s appeal against a planning rejection for a new plant in West London has also been rejected, leaving the company assessing its options about whether to continue its search for a new development. EU-wide legislation on single-use plastic is on the cards for this summer, according to comments by the European Commission’s Vice President Frans Timmermans. £665,000 of new funding has been announced to help local authorities promote the re-use and recycling of waste electrical and electronic equipment. Report estimates that in Kenya 174,000 tonnes of packaging is either taken to illegal dump sites or left in the environment every year. An application for an environmental permit by nuclear energy company Horizon for its £10-billion Wylfa Newydd nuclear power station on Anglesey is to be put before the public by Natural Resources Wales. Bühler UK Ltd has been awarded the Queen’s Award for Enterprise: Innovation for its research into the use of camera technology in sorting machines. Wiltshire Council’s carton recycling has increased to five million cartons collected in the last eight months since kerbside carton collections were introduced. Cup collection and recycling service Simply Cups is set to expand its coverage into the Netherlands and Belgium from June in a bid to capture the 4.5 billion cups used in the two countries every year. PowerHouse Energy, the developer of waste-to-hydrogen technology, has signed an agreement for engineering services with Waste2Tricity. The government is consulting on reforms to the UK’s packaging producer responsibility regime. So what are Defra’s proposals for a new system and how have businesses responded so far? Ecosurety and SUEZ comment.